This Israel and Eastern Mediterranean Wall Map by National Geographic contains extensive political information with political boundaries clearly presented with different color-bands for each country. Beautifully shaded to show physical terrain, this map is both a useful reference tool and a quality piece of art, perfect for any home, office or classroom. Coverage Area is: Egypt, Israel, Jordan, Saudi Arabia, Syria, Cyprus, Lebanon and Turkey. Find it all at Maps.com’s Map & Travel Store! We offer the biggest selection of Wall Maps, Digital & Electronic Maps, Travel Maps and Travel Guides, Globes, Atlases, Gift Ideas and more. Easy online ordering, fast shipping and quality products- Maps.com is your online Map & Travel Resource. Need Assistance finding the perfect map? Call us at 1-800-430-7532. Maps.com ships to US & Canada and 30 countries around the world. Deliveries to Canada are subject to Customs duties/brokerage fees upon arrival. This cost is not included in the product or shipping charges. This product usually ships on the next business day. Click here to read user reviews of this product. The National Geographic Israel and Eastern Mediterranean Wall Map is just one of the thousands or maps available at Maps.com. 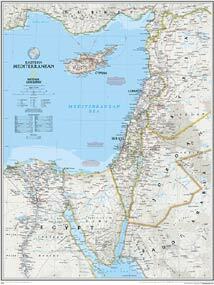 Looking for something other than the National Geographic Israel and Eastern Mediterranean Wall Map? Then check out the rest of the Maps.com site.